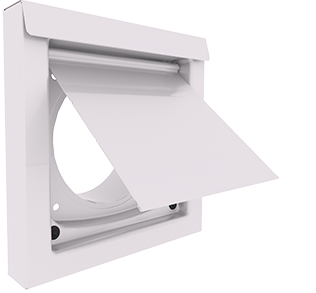 Designed to deliver zero airflow restriction, Dryer Wall Vents™ are safe for dryer venting. Their low profile design and powder coated galvanized steel construction make a nice contribution to every home's beauty. 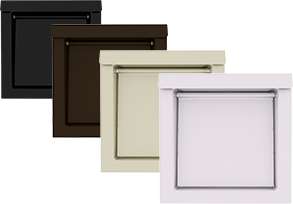 Be sure to showcase your vent installation as a premium grade component. It's a strong selling point that shows home buyers their new house is well made. and tight design, always helps the cause. Every Dryer Wall Vent is built tough in the USA. Unlike plastics which fade and crack from sun exposure, the powder coated, 26 gauge steel housing stands the test of time. The lighter weight damper (30 ga.) and large, clean opening deliver zero airflow restriction. Shorter drying times save money on power bills and reduce wear and tear. 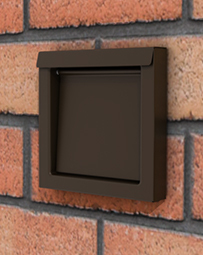 When used as a design component, the Dryer Wall Vent can make a striking contribution to exterior aesthetics. 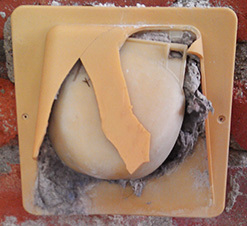 Dryer Wall Vents meet or exceed all code requirements for safely venting a dryer. Built to the same tough standards as the Dryerbox®, they are also aesthetically pleasing wall terminations that enhance a home's exterior beauty. Please take a moment to learn more about the importance of efficiently venting the dryer and how Dryer Wall Vents outperform other exterior termination options. Homes are built to last a lifetime. It's a shame when plastic vents fade and crack. Lightweight metal gets crushed in no time. 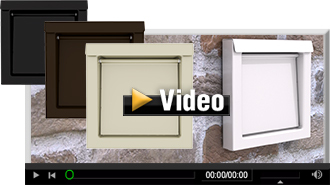 The video introduction at right is a good start for learning more about how the new Dryer Wall Vent is built for the long haul, and how clean lines, a smooth finish and a low profile deliver on the promise that "Venting Never Looked So Good." The story behind the development of a premium grade, quality dryer vent. The importance of airflow efficiency for safe dryer venting. 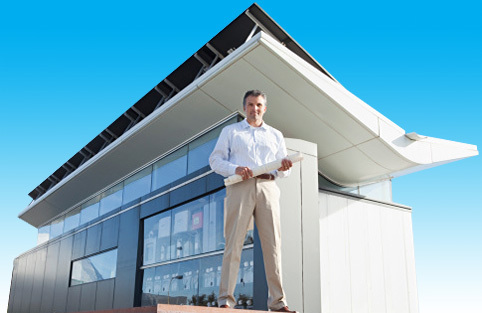 Detailed information including wall vent installation and specifications. One minute video introduction including detail on airflow efficiency. Gallery pictures of clogged and sun damaged vents. Two minute video of easy vent installation. Features detail highlighting what it takes to be a better wall vent. Feedback from the field: dryer wall vent performance. Gallery: pictures of installed dryer vents and product close-ups.